After a 15-year hiatus to raise my adopted son who has high-needs…when I started painting again 3 years ago, I decided that I wanted to do a painting of a red husky. When I was younger, I had a husky who looked very similar to this guy, but he was a bit lighter in color and the markings on his head were a little different. Unfortunately though, I do not have a reference photo that shows how beautiful my dog was that is nearly detailed enough to create a good painting from…so I was very happy to find this one of Axel. 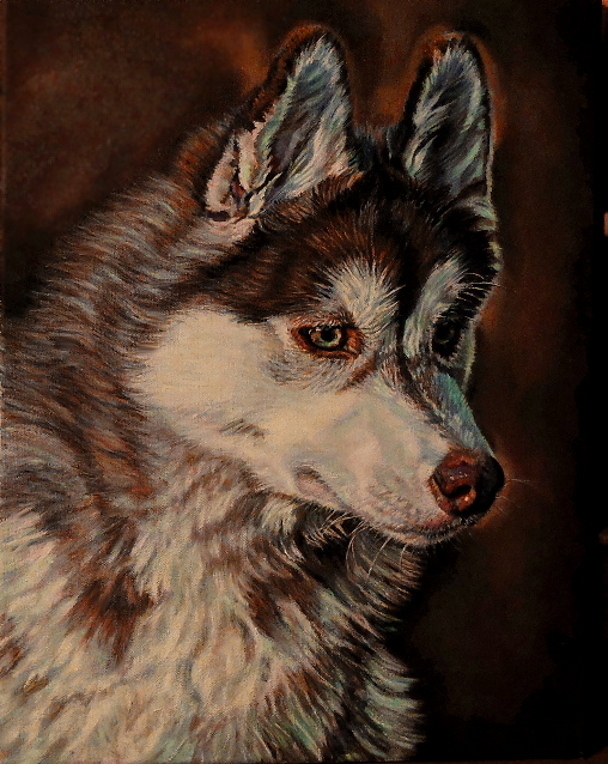 I really enjoyed painting this, I searched for a long time to find an image to work from that reminded me this much of my sweet pup and very dear friend and family member, Chukchi. This painting was a challenge for me because I wanted to have some very detailed areas, such as in Axel’s face; as well as some impressionist areas like the fur on his chest, neck, and shoulder. The colors I decided to go with, were a bit stronger than in the photo I used as a reference. I was able to pull out some turquoise and a more purple-toned blue which were more subtle…plus the background in the photo was originally trees and has green tones, but I wanted to use similar hues as in the reds of Axel’s fur. Thank you to Lorna Dandy for the use of her beautiful reference photo I found on pmp-art’s website.